Li Ling Ho was the first Kaibosh employee! Li Ling played a huge role in setting up Kaibosh in the early years, creating processes that we still use today. 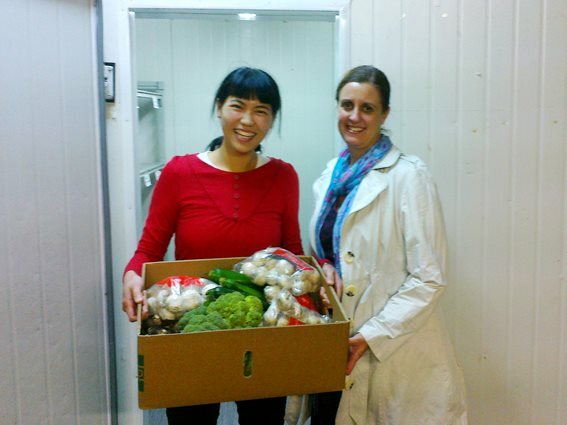 We’re incredibly grateful for all the hard work Li Ling put into building Kaibosh! How were you involved in Kaibosh? I started at Kaibosh in August 2010 as a part-time operations manager. The board finally had sufficient funding secured to hire someone. I’d just finished running my own charitable business (what would now be called a “social enterprise”), and saw the Kaibosh role advertised! It was the perfect fit for me, as a role where I could offer my skills to help them, and a cause that I could be passionate about. The job was full of variety! Setting up Kaibosh operations from scratch, which included the service delivery model, volunteer programme, processes and logistics. Even the food sorting posters! When I first started, food had been stored at home fridges, and there were only 6 volunteers (including the co-founders) that picked up & delivered the food to two charities a few times a week. The board gave it 6 months to prove that the Kaibosh concept & operation would work. With very dedicated founders Robyn & George and the board supporting me, and a great group of volunteers, we were able to prove this in a few months – and it’s now turned 10?! I became the part-time general manager when Kaibosh started hiring more staff. Then, at the end of 2012, I stepped back into a special projects coordinator role to assist the team after we found a full-time general manager (Matt!). I thought it was time to move on in August 2013, as it was in excellent hands with Matt and I also wanted to spend more time with my young children. Kaibosh will always be very close to my heart and I will forever be grateful for the opportunity to be involved with setting it up and to be able to work with a wonderful team of people. Kaibosh addressed such a basic but huge social and environmental issue. Food is a necessity, and some are going without – so why are we throwing it away?! To me, Kaibosh was a simple, practical yet effective way to address this. So many to choose from! Being a start-up, little things were stand-out memories and felt like milestones; Having our own chiller fridges, building a team of volunteers, seeing the service delivery model and food sorting process working so well, moving from the first HQ (a slightly dingy place at the back of Wesley Church) to the Tennyson Street HQ. Seeing our first rescue chiller van, actually having our own rescue drivers and planning logistics for that. Growing from rescuing 20kgs of food a week to hundreds, and getting to know the charities and seeing the impact it had for them! I guess the more ‘public-facing’ memories were where Kaibosh was recognised for what it was doing. Being declared winner at the Wellington Community Awards and then the Wellington Airport Regional Community Awards – only to go on to win the 2012 Supreme Award at the Trustpower National Community Awards! Wow! We were blown away! This was taken with Katrina Shanks, an MP at that time. I remember being excited about her visiting as she was the first MP to take notice of Kaibosh! We took the photo inside the Tennyson Street HQ, standing outside Kaibosh’s reasonably new walk-in cool room (the process around getting a cool room and building it inside HQ is itself another stand out memory).